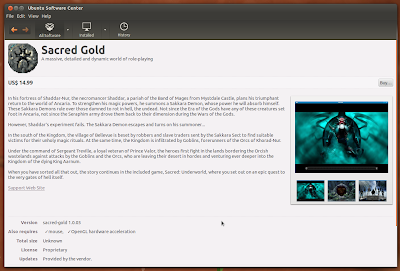 Linux Game Publishing (LGP) has ported a number of commercial Windows games to Linux in past. However, activity has been low in the company in last couple of years and few months back, after over a decade with LGP, CEO Michael Simms announced in a blog post, that he was stepping down and handing over control to Clive Crous. After Clive has taken over the reins, a new patch for one of the Linux game has been provided. Now popular RPG 'Sacred Gold' has been added to Ubuntu Software Center for a price of $15. We’re proud to announce the beginning of a relationship with Canonical bringing you the greatest Linux ports of your favourite games right to your desktop within the Ubuntu Software Centre. LGP is launching with Sacred Gold, a classic RPG with eight unique playable characters ranging from the more well known classes like Wood-Elf to Sacred’s unique characters such as the Seraphim. Sacred Gold includes not only the original game, but Sacred: Underworld as well, where you set out on an epic quest to the very gates of hell itself. Earlier, in a blog post Clive said that: I have great plans for Linux Game Publishing. He also said that LGP is open to the idea of selling Linux games on Steam once it is out. Update: It seems LGP is also planning to publish Sacred Gold on Desura.